Multiple Authors • 10 articles • Item CY146 • $11.95 Junior cyclists are not miniature adults. They have their own unique profile of development based on skills acquisition, physiological, psychological and social considerations. In addition skill acquisition and training is related to growth, development and gender. Applying adult training strategies to these young athletes is doing them a disservice that can lead to injury, burnout and an overall bad cycling experience. 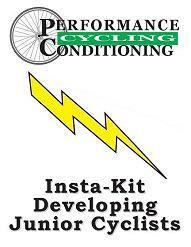 This kit takes an integrative look at how the young cyclist develops and provides programming and training information tailored specifically to the junior cyclists. As a parent or mentor by developing a basic understand of the underlining issues facing the junior rider you can nurture this developmental process to obtain optimal performance and avoid injury and have fun doing it.